After spending hours looking at the wide variety of Apple Watch band options, you’ve probably narrowed it down to just a few different models. One aspect you may not have thought through entirely, however, is what size band you need. Apple is going to allow users to try on the wrist-worn device at its retail stores starting April 10. That is, however, the same day pre-orders become available, so if you don’t want to risk your favorite model selling out before you have a chance to try one on, you can use Apple’s sizing guide [PDF]. We also have a few suggestions to help you figure out which band is right for you. 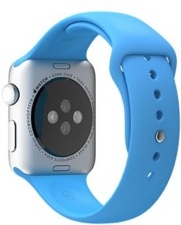 Not all Apple Watch bands are available in every size and not all bands are available with every model. For example, the Classic Buckle is the only band that goes as small as 125 mm (4.92 inches). It is also the only band that goes as large as 215 mm (8.46 inches). Some bands are also available with only some casing sizes, as the Modern Buckle is compatible only with 38 mm casings and the Leather Loop is compatible only with 42 mm models. Below is a rundown of what bands in which sizes are available with each casing (excluding the gold Apple Watch Edition). When looking at the band sizes below, keep in mind that the average woman's wrist is between 140 mm (5.5 inches) and 170 mm (6.7 inches) and the average man's wrist is between 165 mm (6.5 inches) and 195 mm (7.8 inches). *Watch and standalone band pack each come with both S/M and M/L bands. 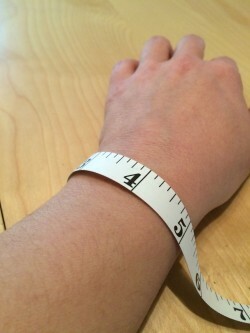 The first thing you should do is measure your wrist. Using a cloth tape measure (or a string measured with a standard ruler), you'll typically want to wrap your left wrist if you are right-handed or your right wrist if you are left-handed. Wrist preference for watches is, however, purely a personal thing, so feel free to use whichever wrist feels more comfortable to you. 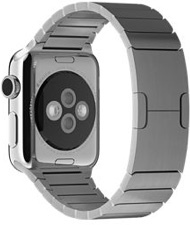 The Apple Watch has settings to allow it to be used on either the left or right wrist, although positioning of the Digital Crown and side button will be reversed depending on orientation. Most cloth tape measures are based on inches, not millimeters, so you may want to convert your measurement. One inch is equal to 25.4 mm, so if your wrist is seven inches in circumference, multiply by 25.4 to get 177.8 mm. Or, you can reference our conversion guide above. 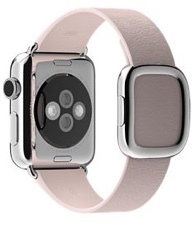 Taking a seven-inch wrist as the model, you can see that the Modern Buckle might not be a comfortable fit. Although the large size covers wrist of up to 7.1 inches, you won’t have any room for weight changes or slight puffing at night (or while going on long walks). If your wrist measures seven inches in circumference, you may want to avoid the 38 mm case for all models except the Link Bracelet, Classic Buckle, and Sport Band. If your wrist measures more than eight inches in circumference, your options for the 38 mm case are even more limited, and the Sport Band would be your best option. In the reverse, a smaller wrist, say one that measures 5.5 inches in circumference, might find some of the 42 mm models to be a bit too loose. 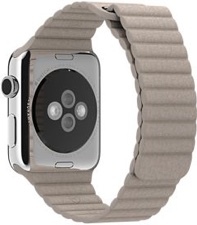 The Sport Band would be the best options for someone with a 5.5-inch wrist looking for a 42 mm casing, although you would probably find the Classic Buckle to fit fairly well since it is only 0.16 of an inch larger. While a slightly larger band is easier to get used to than a slightly smaller band, the Apple Watch needs to be worn snugly so the sensor on the back of the device can accurately pick up the user's heart rate. Considering all of the different band/casing combinations and available band sizes should give you a good start on picking the right Apple Watch band ahead of the pre-order launch. With any luck, your favorite option won't sell out. The first round of pre-orders for the Apple Watch will be available in nine countries starting April 10, both online and in Apple retail stores. The wrist-worn device will launch across those countries on April 24. Prices start at $349 for the aluminum Apple Watch Sport model, $549 for the stainless steel Apple Watch model, and $10,000 for the gold Apple Watch Edition Model. Starting April 10, you will also be able to make a reservation or stop by an Apple retail store to try on the Apple Watch and place pre-orders. Yeah, like 13 or 72 of them. Apple uses ONLY metric measurements on that watch sizing chart. At least it's showing that Apple want to keep up with the modern times. The SI system was published in 1960 as the result of an initiative that started in 1948. So the people (like the MacRumor Staff) who insist on stubbornly refusing to use the SI system have not moved past 1948. It seems that some people don't stubbornly refuse to use the SI system. I don't know why. An irrational hatred for the French maybe? I think they're worried that if you give someone 25.4mm, they'll take 1.609 km. Worthless Commentary for the sake of nothing! Thanks again Lory Gil for posting this completely unnecessary article for no other reason than to capture the inevitable search traffic closer to the launch date. 100% of this information is already available on Apple's website, except for the wonderfully helpful tips on how to convert inches to millimeters. Thanks so much for that tidbit. I will thank you just the same and expect in the future that you will keep your "NOT WORTH ANYTHING" opinion and commentary to yourself in future. Such remarks just clarify that you have nothing to offer yourself and express your own pitiful thoughts in form of derogotory comments toward others. I personally found the article informative and am not concerned that it may be re-hash of what is available on Apples Website. So please, refrain from commenting... it is offensive... better yet "GET A LIFE!!!!" Buckle up and Watch the action unfold! A choice of band length? That's a massive number of different SKUs! After spending hours looking at the wide variety of Apple Watch band options, you've probably narrowed it down to just a few different models. Hahaha hours?? I sincerely hope no one is spending that much time on that little sizing chart. Just go in on the 10th and try it on in person. There won't be a huge rush to get this thing because it's an optional accessory, a companion to the must-have iPhone. (And a pricey one at that). Let's see how many people get it though. This is the most complicated and cumbersome Apple product ever released. 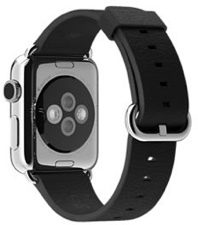 I just stick with the base stainless steel  Watch black rubber band. 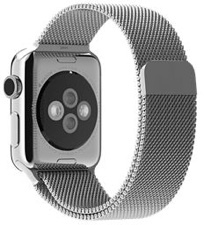 It's free if I buy them with the watch and later on once supply catches up with demand and the Apple stores are no longer busy I'll consider the Milanese loop and classic buckle.